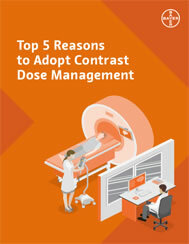 In our latest report, Top 5 Reasons to Adopt Contrast Dose Management, you'll discover some of the clinical, financial and operational improvements your peers are experiencing. 1American College of Radiology Practice Parameter for Communication of Diagnostic Imaging Findings and Bayer Overview of the CMS Guidelines and Medication Recording. Bayer, the Bayer Cross, Medrad MRXperion and MEDRAD Stellant are trademarks owned by and/or registered to Bayer in the U.S. and/or other countries. © 2018 Bayer. This material may not be reproduced, displayed, modified or distributed without the express prior written consent of Bayer. Bayer HealthCare LLC. 100 Bayer Boulevard, P.O. Box 915, Whippany NJ 07981.